ST-segment elevation myocardial infarction (STEMI), non–ST elevation acute coronary syndrome (NSTE-ACS) and unstable angina include acute coronary syndromes. The electrocardiogram has a vital role for the diagnosis of any of these pathologies. The EKG remains a crucial tool in the identification and management of ST-segment Elevation Myocardial Infarction (STEMI) 1. STEMI usually occurs after a rupture of an atheromatous plaque in a coronary artery, complicated with thrombosis. This causes an occlusion of the artery and subtotal or total interruption of coronary flow, causing myocardial injury, and subsequently, myocardial necrosis. A 12 Leads Electrocardiogram must be performed in all patients with acute chest pain. Electrocardiogram in Acute Myocardial Infarction presents progressive changes, with the increasing the duration of infarction. The main change in the early stages is the ST segment elevation in at least 2 contiguous leads 2. From Universal Definition of Myocardial Infarction 3. New ST elevation at the J point in at least 2 contiguous leads of ≥2 mm in men or ≥1.5 mm in women in leads V2–V3 and/or of ≥1 mm in other contiguous chest leads or the limb leads. STEMI is a medical emergency and medical staff must activate the relevant protocol to ensure reperfusion (opening) of the occluded coronary artery as soon as possible, with Fibrinolysis or Primary Angioplasty. Hyperacute T Waves: Broad, asymmetric and peaked T Waves. They are the first change in Electrocardiogram on an STEMI. In practice they are rarely recorded. ST segment Elevation: The most important change of Acute Myocardial Infarction, occurs within a few minutes, in the nearest leads to myocardial injury. Pathological Q Wave: Appears between 6 and 9 hours of occlusion, in the same leads to ST elevation. It is an electrocardiographic sign of transmural myocardial necrosis (See Pathological Q Wave). T Wave Inversion and normalization of the ST Segment: After Q wave appear, the T wave flattens out, and subsequently becomes negative. ST Segment begins to decline, and return to normal after several days, but some patients may have a residual elevation. Loss of R wave height: It occurs after 12 hours of STEMI, in the same leads that previous events. Due to urgent treatments of ST-segment Elevation Myocardial Infarction (fibrinolysis or primary angioplasty), electrocardiogram changes of STEMI may vary. The EKG signs described may appear before, later or not at all. An Electrocardiogram with ST Segment Elevation in several contiguous leads is almost certainly a medical emergency. EKG of ST Elevation in V1-V4 (anteroseptal leads) and Right Bundle Branch Block. The electrocardiogram is the main tool for early diagnosis for Acute Myocardial Infarction, allowing take appropriate actions to restore, as soon as possible, the blood flow in the occluded artery. Question: Are there other causes of ST elevation on the EKG? How to distinguish STEMI from other causes? Symptoms and Medical Record: The best way to illustrate this point is an example. Two patients have ST elevation in anterior leads. 1. A 65-years-old patient, smoker, with hypertension and diabetes mellitus with severe chest pain. 2. An asymptomatic young athlete with routine EKG. The first patient is likely to have an Anterior Acute Myocardial Infarct and the young probably has an EKG of Early Repolarization. ST Elevation Morphology: ST elevation in STEMI is usually convex, while in Acute Pericarditis and Early Repolarization is usually concave. STEMI: Convex ST Elevation, normal PR segment. Pericarditis: Concave ST Elevation, PR Segment Depression. Location: ST segment elevation is not present in all EKG leads. It occurs only in leads near the ischemic walls. The number of leads affected indicates the infarct extension. Greater number of leads with ST elevation means greater myocardial injury, worse prognosis, and more risk of complications. If there were ST elevation in all leads except aVR, is likely to be an Electrocardiogram of Acute Pericarditis and not an EKG of STEMI. Reciprocal ST Segment: Important, if this were a book, now you should mark the next paragraph with a marker. If there are ST Elevation and ST depression in opposite leads in the same Electrocardiogram, the EKG is diagnostic of STEMI. 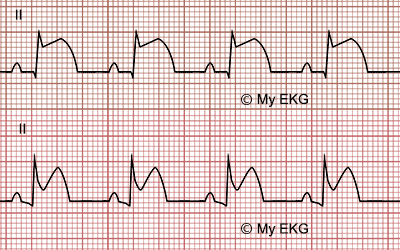 Myocardial damage in STEMI occurs in a specific region of the heart, so ST elevation is observed in the nearest leads. And what about the more remote leads? A reciprocal depression of ST Segment is observed. This is called Reciprocal changes or “mirror image”, it is an important sign of ST-segment Elevation Myocardial Infarction. Certain patients may present a difficult diagnosis of STEMI in the EKG, either by previous alterations, or new alterations caused by the infarction. New left bundle branch block or LBBB known. In these patients the clinical history and the pursuit of certain specific findings on the electrocardiogram, allow us to make an accurate diagnosis of Acute Myocardial Infarction, and ensures the patient an early coronary reperfusion as patients with classic EKG. 1. Zimetbaum PJ, Josephson ME. Use of the Electrocardiogram in Acute Myocardial Infarction. N Engl J Med 2003; 348:933-940. 2. O'Gara PT, Kushner FG, et al. 2013 ACCF/AHA Guideline for the Management of ST-Elevation Myocardial Infarction. J Am Coll Cardiol. 2013;61(4):e78-e140. 3. Thygesen K, Alpert JS, Jaffe AS et al. Third universal definition of Myocardial Infarction. European Heart Journal (2012) 33, 2551–2567.